Many things were happening simultaneously during the most recent landing of NASA JPL’s InSight Lander on Mars such as precise attitude control equipment for the MarCO CubeSats positioning their antennas exactly as needed to relay data from InSight back to Earth. While people around planet Earth were eagerly listening to the events unfold with NASA JPL’s InSight Lander on Mars, NASA JPL’s MarCO CubeSats were busy making history themselves by relaying, in real-time, the telemetry from InSight back to Earth. The two MarCO CubeSats, the first-ever interplanetary CubeSats, were guided throughout their 6.5-month journey from Earth to Mars using Blue Canyon Technologies’ (BCT) XACT Attitude Control Systems. The XACTs (fleXible Attitude Control Technology) provided the precision necessary to point the MarCO reflect-array high-gain antennas back toward Earth to relay the data collected from InSight during its entry, descent, and landing on Mars. The CubeSats also relayed the first image from Insight. Additionally, the XACTs provided control of the on-board propulsion system during multiple trajectory correction maneuvers throughout its journey to the Red Planet. 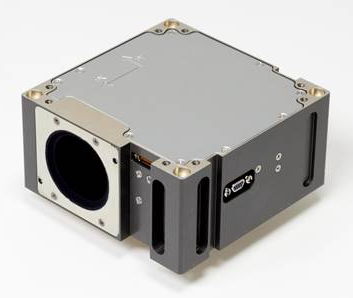 The XACT system contains a precision nano-star tracker with sun keep-out baffle, three low-jitter reaction wheels, multiple sun sensors, an IMU, and a fully-programmed hyper-integrated electronics board, all within a 10x10x5 cm package. The system supports virtually any mode of pointing, and provides the highest precision pointing available for spacecraft in its class, measured on orbit by another mission to be better than 0.001 deg, RMS. Multiple XACTs have flown in LEO missions, and are baselined in approximately 60 different user-built CubeSats for LEO, GEO, Lunar, and deep space missions. The same technology is also baselined in an additional 60 turn-key spacecraft being built by BCT, ranging from 3U to 200-kg ESPA class.